Echinacea is a robust perennial flower with herbaceous foliage. A member of the daisy family, it sports single flowers about three inches wide on a sturdy stem and usually grows from two to four feet high. The flowers, which are highly attractive to butterflies and bees, come in shades of lavender, pink, white, off-white, magenta, and yellow. In the home garden, however, echinacea blooms seen most often are rose-pink, or light violet to a darker purple, being commonly known as purple coneflowers. The flowers are vibrant with a large, cone-like red/orange center and petals that range from horizontal or flat to drooping away from the cone center. There are nine known species of echinacea, all of which are native to the United States and southern Canada. The following three species are the most commonly cultivated for medicinal and landscape purposes. E. purpurea, or purple coneflower, is the most common garden variety of echinacea. This handsome, bushy plant has dozens of flowers when full-grown, with flat or drooping petals in shades of rose-pink to reddish violet. ‘Alba’ has ivory or creamy-white blooms. ‘Bright Star’ has rose pink flowers. ‘Magnus’ has large, flat rose-pink flowerheads. ‘Fragrant Angel’ is a newer white variety with fragrant, overlapping petals in a horizontal form. Pale rose, drooping flowers on sparse branches and almost leafless stems, this variety is hardy in zones 3 to 10, will often rebloom even without deadheading, and freely self-seeds. Compact coneflower with narrow leaves, mostly leafless stems topped by two inch rose-pink flowers. Also known as Western Coneflower, Narrow Leaf Coneflower or Black Samson Coneflower. New hybrids of echinacea are appearing all the time, with exciting new color combinations reminescent of fruit such as a coconut and lime, orange and mango, as well as sunrise and sunset hues ranging from pale yellow to carmine red. To make echinacea tea, place 1 tsp. of dried or 2 tsp. fresh coneflower leaves/flowers in a teapot and add boiling water. Steep for 15 minutes. Add a little honey if desired and enjoy! Echinacea is a North American native that is popular with many gardeners due to its hardy nature and striking appeal. Purple coneflowers last about a week in a vase and dry well, making them useful for bouquets and ornamental wreaths. Echinacea is also found in the wild, although you should take care not to pluck any wild purple coneflower as some species are classified as endangered. This herbaceous plant is easy to sow, cultivate, maintain, and divide. It makes a nice addition to any border or flower garden, blooming throughout the summer. The seed heads look attractive in the fall and winter and offer a feast for the birds. Good companion plants include the shasta daisy, bee balm, liatris or perennial phlox. In a meadow or prairie garden, try growing echinacea with native or ornamental grasses, goldenrod, butterfly weed and poppies. Purple coneflowers prefer full sun to partial shade and soil that is fertile and well drained. It blooms from June to October. Since echinacea takes more than a year to fully mature, it is best to purchase echinacea plants in the spring, choosing healthy specimens with buds and new growth. Dig a hole twice the size of the pot, and apply a little fertilizer. Place the plant in the hole, making sure it is not any deeper than it was in the pot. Place plants about a foot apart and cover with soil. Water well until the plants are established. Purple coneflower handles drought well, but prefers moist soil. Cutting back the stems after flowering prevents self-seeding and encourages more blooms. Growing purple coneflower from seed is fairly easy and simple; you may even get volunteer plants from self-seeding. If you’re using new seeds, however, placing the seeds in the fridge for a week may help germination. Plant the seeds in early spring or just before the last frost in the fall. Place the seeds on the soil surface, and cover with &frac14 inch of soil. Space the seeds about an inch apart. Germination occurs in 15-30 days. Some types of echinacea seeds like a dark environment, others a light one. The most common type of purple coneflower, E. purpurea, prefers a dark climate. As the plants get taller, space them about a foot apart. Water the seedlings regularly until the plants are well established. Follow up with weekly watering if rain is scarce. Collecting seeds from purple coneflowers is also easy. Simply shake them from the flower in the fall after blooming has ceased. , tends to promote bushy plants with fewer flowers. Division is therefore best done by root cuttings in the fall. Echinacea has traditionally been used to treat or prevent colds, flu, and other infections. Echinacea is believed to stimulate the immune system to help fight infections. 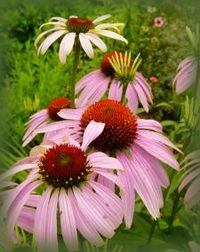 Less commonly, echinacea has been used for wounds and skin problems, such as acne or boils. The aboveground parts of the plant and roots of echinacea are used fresh or dried to make teas, squeezed (expressed) juice, extracts, or preparations for external use. Studies indicate that echinacea does not appear to prevent colds or other infections. Studies to date have not proven that echinacea shortens the course of colds or flu. For example, two studies funded by the National Center for Complementary and Alternative Medicine (NCCAM) did not find a benefit from echinacea, either as Echinacea purpurea fresh-pressed juice for treating colds in children, or as an unrefined mixture of Echinacea angustifolia root and Echinacea purpurea root and herb in adults. Other studies have shown that echinacea may be beneficial in treating upper respiratory infections. NCCAM is continuing to support the study of echinacea for the treatment of upper respiratory infections. When taken by mouth, echinacea usually does not cause side effects. However, some people experience allergic reactions, including rashes, increased asthma, and anaphylaxis (a life-threatening allergic reaction). In clinical trials, gastrointestinal side effects were most common. People are more likely to experience allergic reactions to echinacea if they are allergic to related plants in the daisy family, which includes ragweed, chrysanthemums, marigolds, and daisies. Also, people with asthma or atopy (a genetic tendency toward allergic reactions) may be more likely to have an allergic reaction when taking echinacea. It is important to inform your health care providers about any herb or dietary supplement you are using, including echinacea. This helps to ensure safe and coordinated care. Rodale’s Illustrated Encyclopedia of Perennials, Echinacea Compositae, Daisy Family Copyright © 1993 Rodale Press Inc. I have established echinacea in a bed next to common daisy. This year I was surprised to find of the common daisy with a purple echinacea shaped flowers. That is an intriguing development. Echinacea is a member of the daisy family, but I’ve never seen this kind of cross-pollination personally. It’ll be interesting for you to see what happens.